The next-generation JBL 305P MkII powered studio monitor makes legendary JBL performance available to every studio. With the revolutionary JBL Image Control Waveguide and refined transducers, JBL 305P MkII offers stunning detail, precise imaging, a wide sweet spot and impressive dynamic range that enhances themix capabilities of any modern workspace. Leveraging patented technologies derived from the JBL 7 Seriesand M2 Master Reference Monitors and sporting a sleek, modern design, JBL 305P MkII delivers outstanding performance and an enjoyable mix experience at an accessible price. 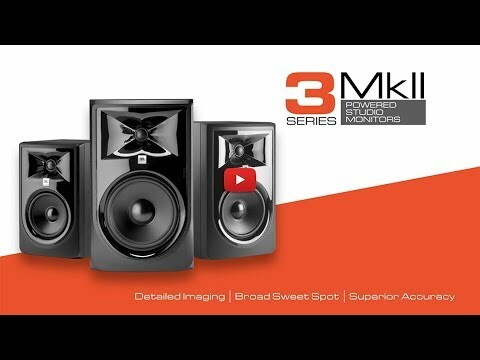 JBL 305P MkII has been equipped with acclaimed 3 Series transducers that now perform even better. Hear deep, accurate and tightly controlled bass, thanks to a long-throw 5" woofer and the patented JBL Slip Stream™ low-frequency port. Enjoy soaring, immaculately detailed highs, via its woven-composite 1" Neodymium tweeter.